I offered this a couple of times and ananya enjoyed every time she played with. Also, her imagination and the kind of play with ice cubes kept changing every time she played with it. Today, I made her do it from scratch. Prepare coloured water for which I used beetroot for the red colour and edible colour powder for orange ones. Pour it in tray carefully so that the water doesn't spill out the cube. She was a true expert in doing this which I had not expected. She stopped pouring right before the cube was about to get filled. Kids are awesome learners. They only crave for the right environment to be provided and a loving guidance. Get a step stool, open fridge door, put the tray in its place. Wait for some time. 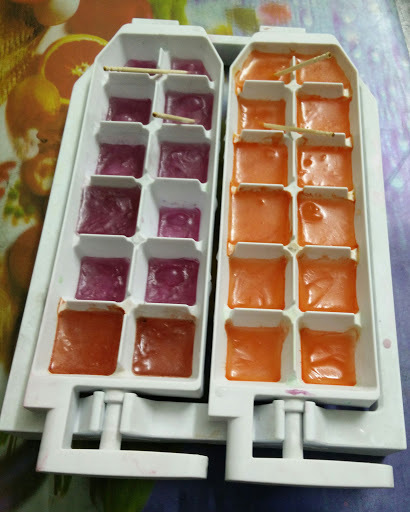 After around 20 minutes, get four toothpicks, insert two in each of the coloured cubes, show her that ice formation is not yet complete, it is still soft and watery inside. Put back the tray. Close fridge. Again, wait. Open the fridge, remove the tray, play with the coloured cubes.